Before we move on to the next pair of sisters, Martha and Mary, we will revisit the story of Jacob, Leah, and Rachel by posing a few questions and considering some interesting facts. How much time elapsed before Jacob took his family back to his homeland? In Genesis 31:41 Jacob says to Laban, “Thus I have been in your house twenty years; I served you fourteen years for your two daughters, and six years for your flock.” It seems likely by the time they left, Leah’s older sons were teenagers and Joseph under the age of ten. As Jacob’s family grew in size, where did they live? Genesis 31:33 indicates each of Jacob’s wives and handmaids had her own tent. Laban searched through each one looking for his stolen idols. I assume the children lived with their mothers. Did other instances of jealousy trouble this family? Genesis 31:1 opens with Laban’s sons fretting about the possibility of Jacob draining off their father’s wealth. 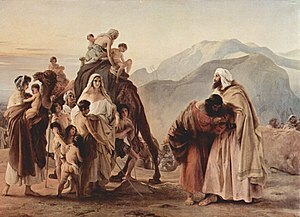 It was enough of a concern to cause Laban’s disposition toward him to change, and the Lord instructed Jacob to return to his homeland. Even Leah and Rachel got into the mix, wondering about their inheritance. Tension filled the air. Rachel stole her father’s idols before they left, and hid them in her camel saddle. The Woman’s Study Bible note regarding Genesis 31:19 comments these were “teraphim,” small household figurines possibly used for divination. Some ancient records of contemporary law connected ownership of the household idols with inheritance rights. It may be Rachel took matters into her own hands, trying to insure she and Leah would have rights to their father’s estate. Did Jacob ever grow to love Leah? The Bible does not specifically say, but the following scriptures may give some indications. In Genesis 31:31 Jacob worried Laban would take back his daughters by force. He obviously cared for them both, but was this a matter of love, possessions, or both? Later Jacob braced himself for the first meeting with Esau in twenty years. Not knowing what to expect, he developed a specific plan of approach toward his brother and his band of 400 men. The maidservants and their children would go first; Leah and her brood followed; and Jacob, Rachel and Joseph came last. In the case of co-wives, one always enjoyed most favored status, and it is obvious here that Rachel still held that rank. Scripture reveals a couple of intriguing facts about this family. I find both tinged with a certain irony. First, Leah was the wife interred in the ancestral cave at Machpelah, near the bones of Abraham and Sarah, and Isaac and Rebekah (Genesis 49:31). At death Jacob would join her. Rachel died earlier in childbirth in route to Ephrath (Bethlehem) and was buried along the way—forever separated from the man who loved her (Genesis 35:18-20). The second concerns the descendants of these sisters. Leah’s line traces to David (and eventually to Christ) through Judah and Rachel’s to Saul through Benjamin. 1 Samuel bears witness that vestiges of their sibling rivalry endured, only this time it worked in the lives of two kings. Surely Joseph is NOT referring to Bilhah as being the “moon” [translated by Jacob as mother] that would be bowing down to him since Rachel was dead, see Genesis 37: 9 and 10. Reading and rereading it over repeatedly through the years, I still think it refers to Leah. Personally, I think the Midrash has not interpreted the scriptures correctly re much of the story. I think we have to go by the account in the Tanach not the Midrash. Regardless, Leah worshiped God; Leah was an idol worshipper regardless of what the idols represented. Furthermore, scripture says Jacob loved Joseph because he was born in his old age, NOT because he loved Rachel. Scripture also suggests that even Benjamin was jealous of Joseph and that Jacob loved him more than Benjamin. Read it carefully. Did Jacob ever love Leah? Who knows; even so, he honored her as first wife by burying her in the ancestral plot. He could have buried Rachel there; he did NOT! Midrash, pooh!!! Here I am again! Another mystery in this ancient love triangle: how in heavens name did Jacob not know who he was with on his wedding night??? No matter how drunk he was, HE HAD KNOWN RACHEL FOR SEVEN YEARS. Even if he had never made love to her before marriage, he had kissed her- and I’m sure he got a chance to steal a few kisses during those seven years. When you’ve known and loved someone that long you know their shape, their kisses, their hair and skin-even their scent. This I don’t get! I have to agree with you. It is certainly hard to imagine such a thing. I think I read something about this recently. I’ll try to find it and get back to you. Thanks again for stopping by! Another interesting fact -Leah ended up raising Joseph and Benjamin, Jacobs two sons by Rachel. Joseph was a great man, and Leah probably helped make him that way. Also, since Rachel died in childbirth, Leah was really the only mother Benjamin knew. Hello, and thank you for your comments. I’m intrigued by your statement about Leah rearing Joseph and Benjamin. Do you have a source for that? I’d be curious to follow-up on it. I had thought about the possibility of Bilhah fulfilling that role as Rachel’s maid, but hadn’t considered Leah. Thanks. I have always been intrigued by the story of Jacob and his family. I believe he did eventually grow to love Leah, because he chose to be buried with her. Another thing too: so little is mentioned about the two minor wives, Bilhah and Zilpah. What were their personalities like? How did they feel about basically being given to Jacob by their mistresses? We hear about Bilhah committing adultery with Reuben, Jacob’s son. Was she in love with him? Or did he just take her to spite his father? So many mysteries! Hello, and thanks for your comment. Jacob’s story is fascinating each time I read it. I’ve thought about his being buried with Leah in the same way. I find it really difficult to understand the culture of that day, and the role of concubines and secondary wives. As you said, so many mysteries!